A mentally unstable man with a violent and armed past was found firing crossbow bolts out of his window hours after police failed to turn up to answer 999 calls about his behaviour. A court was told the incident took place after Christopher Gallagher went into a health centre with an axe and told staff he would behead them. The Crown said Gallagher, 26, had been reported to police at 4.30am on March 26 as he had been shouting threats in the street to his terrified neighbours. Depute fiscal Bill Kermode told Perth Sheriff Court: “The witness was woken by the accused shouting. The neighbour never looked out because they were scared the accused would see them. “The shouting went on for 10 minutes and the police were called – but no units came to attend. At 6.30pm the same witnesses heard the accused shouting and swearing and the police were contacted again. “There had been reports of him shooting something out of the window. “He had been shooting crossbow arrows out of the window and they were sticking out of the shed. Police attended at 6.45pm and traced the accused. 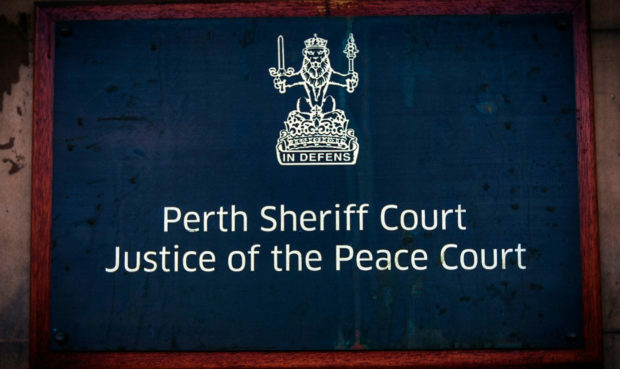 Gallagher, of Smith Lane, New Alyth, admitted acting in a threatening or abusive manner by shouting and swearing at his home on March 25 last year. He also admitted frightening staff at Blairgowrie’s council housing office on January 5 last year by shouting, swearing and by kicking a chair and counter. Gallagher also admitted having an axe at Alyth Health Centre and making threats of violence while shouting and swearing on October 23 2017. Mr Kermode told the court: “He approached the reception and was extremely angry and agitated. The accused told a member of staff he was holding an axe and was prepared to chop heads off if he didn’t get any help. The doctor saw Gallagher before police arrived and recommended removing him to a psychiatric hospital. Sheriff Lindsay Foulis said: “He has quite a few convictions for disorderly conduct, including one where he’s got a brick. He’s got one assault conviction and a breach of the peace where he has a knife. The sheriff said he was not questioning that Gallagher might have psychiatric issues, but it was not acceptable for him to have gone into a health centre with an axe and threatened two women. “He’s holding an axe and saying ‘I’m prepared to chop heads off if I don’t get any help.’ It is little wonder these members of staff were extremely frightened. It is extremely concerning,” he said. He jailed Gallagher for a total of 12 months and ordered destruction of the axe and crossbow.